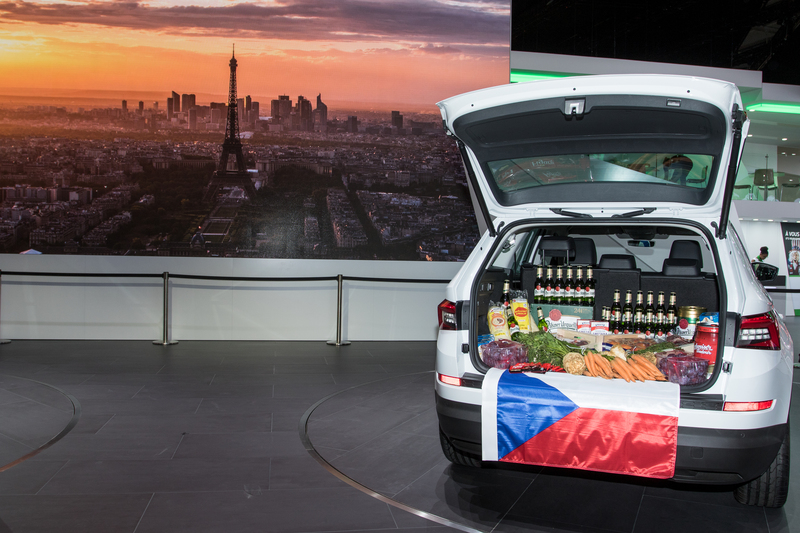 From Prague to Paris: the ŠKODA exhibition team has made their way across Europe to bring the new KODIAQ, which is celebrating its motor show premiere in Paris, to the city on the Seine in time for the opening of the exhibition. The surface of the River Vltava is glistening in the morning sun as we’re leaving the Golden City behind us to make our way to Paris, on a road trip of more than 1,000 km. The E50 takes us south-west, past Pilsen until we eventually reach Bavaria. Then it’s straight across Germany. Travelling through Franconia, we’re passing extensive forests and green hills until, just after Saarbrücken, we eventually reach France, the homeland of ‘haute cuisine’, Paul Bocuse, and the Michelin guide. 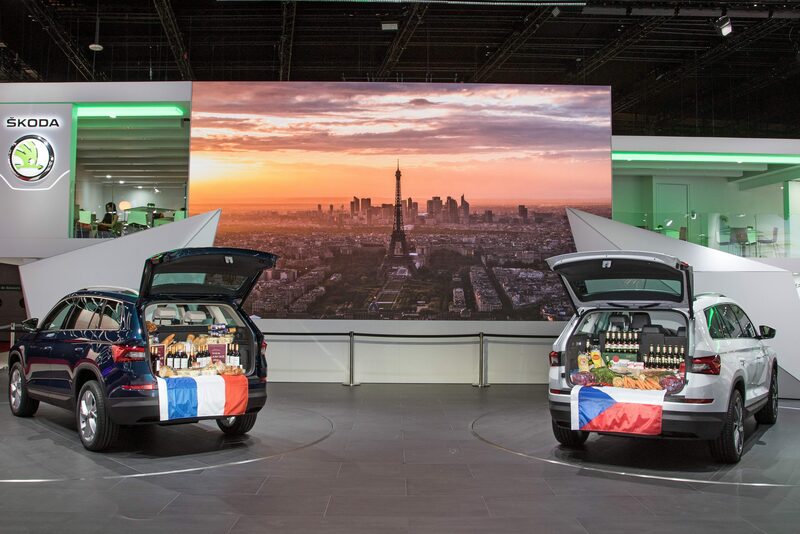 Our destination is the world’s biggest motor show: the ‘Mondial de l’Automobile’ in Paris where we will present the brand-new KODIAQ – ŠKODA’s first large SUV. With a length of 4.70 m, up to seven seats and the largest boot within its class, the KODIAQ makes a big statement – at least on paper. Wanting to know exactly how much actually fits into the new space miracle, we packed the KODIAQ full of treats from our homeland, bringing a Czech national’s seven most important foods with us to our hosts in Paris. The Czech Republic is one of the most notable producers of beer in the world. On average, each Czech drinks approximately 140 l a year – which equates to 14 crates. Especially in summer, many beer festivals are held here – often combined with music events. The Czech Republic has a total of several hundreds brands of beer; some of the most popular include Budweiser Budvar, Gambrinus, Pilsner Urquell and Staropramen. Fitting this in is no problem with the KODIAQ’s standard boot capacity of 720 l. Even with seven people in the car, several crates will still easily fit in the boot. The Czech Republic is one of the most notable producers of beer in the world. But the Czech menu has more to offer: Dumplings and potatoes, typical Czech cheese but also vegetables and fruits are bestsellers. Of course, the Czech menu has more to offer: ‘knedlíky’, or dumplings, are a bestseller. The dumplings are often a side dish, also to another classic from Bohemian cuisine: ‘svíčková na smetaně’ – roast loin with cream. Sweet versions, usually with quark as a main ingredient, are also a delicacy – particularly popular when filled with apricots or plums. We have also packed 12 kg of cheese. ‘Smazak’, a breaded and fried cheese, is a national dish. ‘Hermelín’, a mature cheese with a coating of white mould, is also very popular – essentially the Czech version of the legendary French Camembert. ‘Hermelín’ is also round, has a slight taste of mushroom and a creamy consistency. Czechs enjoy it marinated in oil, for example with peppers, onions and spices. Moreover, just like the French, Czechs also enjoy a little glass of wine every now and then. Znojmo, Mikulov and Valtice in Moravia are said to be the country’s wine capitals. A few vineyards can even be found in Prague. And last but not least, Czechs with a sweet tooth enjoy chocolate – predominantly from the long-established brand Orion. These enormous quantities are no problem for the KODIAQ because, with the back seat folded down, the boot can hold an impressive 2,065 l! French cuisine is world famous. 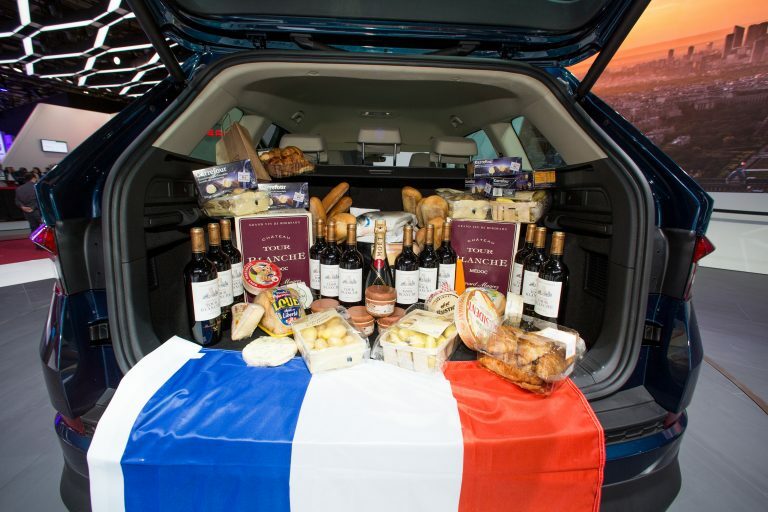 Among the most popular goods are wine, champagne, baguette, croissants and cheese, of course. Living in the lap of luxury is easily done in France. French cuisine is world famous. Above all else, meat lovers are delighted about the numerous pies; coq au vin or beef bourguignon are also famous around the world. A ‘good red’ goes well with it all; red and rosé wine have a market share of around 73 per cent. Wines from Bordeaux and Burgundy are most popular. The Champagne wine-growing region, with its hallmark champagne, is equally world famous. Champagne from the region is trademarked and is a staple at parties and weddings. Do all French people always have a baguette under their arm? This stereotype is often used abroad – and not without reason. With a consumption of 60 kg bread per year, France is well ahead of other European countries. So we neatly pile stick after stick in the boot. Accompanied by cheese, of course. In every French supermarket, the hearts of cheese lovers beat faster: whether Camembert, goat’s Brie from Brittany, the hard cheese Beaufort or the milder Comté – in France, cheese complements any good meal. We also pack all kinds of well-chilled fish and seafood from the Atlantic and Mediterranean coast to take with us to the Czech Republic. Freshly caught, most fish ends up in the Parisian market Rungis, the ‘El Dorado’ of fish lovers. If you’re after something sweet, there’s no need to stop at any services on the return journey. Although France cannot be compared to Belgium or Switzerland in terms of quantity; in terms of quality, French chocolate does not have to hide. There are lots of boutique chocolatiers, also turning goat’s milk, for example, into sweet treats. Well-known chocolatiers include Michael Cluizel, Valrhona, and Jean-Paul Hévin from Paris. The ŠKODA KAROQ SCOUT versus the SPORTLINE – How to Tell Them Apart?